Redefine your favorite spaces at Floortech of Racine. We are your source for waterproof floors in Sturtevant, WI, that will improve the strength, appeal, and value of your home. At our showroom, you can view hundreds of flooring products and find the right materials to complete your interior remodeling project. With our customer-oriented approach to service and professional installation solutions, you have the power to turn those remodeling ideas into reality. An impressive catalog of waterproof flooring awaits you. Thanks to our partnership with the leading manufacturers, we provide many options for re-flooring your home. Our collection is so wide-ranging that you can revitalize virtually any room, including the kitchen, bathrooms, commons areas, and much more. Not sure where to begin? Don’t worry--we’re here to help. Our knowledgeable flooring associates can assist you in working out the details. We’ll listen to your remodeling goals, make recommendations, and even arrange the installation. We’re with you at every step, from start to finish. With water-resistant floors, you never have to make compromises between form and function. This category of flooring is highly versatile, making it a great choice for any room in your home. Our waterproof flooring selection includes luxury vinyl and carpeting, allowing it to work with any design you have planned. For homeowners with active lifestyles, we recommend waterproof luxury vinyl planks. This flooring option has a solid surface that repels liquid. Simply wipe away any accidental spills, and you’re set. On top of that, luxury vinyl plank goes well in almost any room. We even have designs that mimic the appearance of other flooring materials, like solid hardwood. Establish a welcoming ambiance with water-resistant carpet. These products are manufactured with special fibers and dyes that make this flooring material resilient against spills and stains. 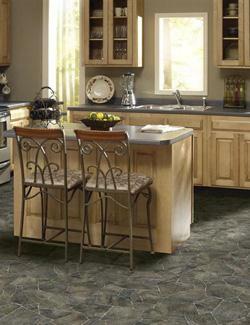 Since this flooring material is easy to clean and maintain, it is a great addition to common areas and bedrooms. Whether your interior design plans prioritize striking visual appeal or everyday dependability, you can’t go wrong with our waterproof floors. Our showroom features products in a variety of designs, styles, colors, and patterns. Explore our catalog and redefine your spaces easily. Make sure your new investment looks great and lasts for years to come. Proper installation ensures new flooring is strong and appealing. When it’s time to complete your project, leave the hard work to us. We facilitate water-resistant flooring installation. Our showroom has an in-house installation team comprised of skilled and experienced flooring technicians. We will take care of every aspect of your re-flooring project, including the removal of old flooring and the placement of the subfloors. With our comprehensive approach to service, remodeling your interior is a simple, stress-free, and rewarding experience. Contact us to to learn more about our waterproof flooring. We serve customers in Sturtevant, WI, as well as Mt. Pleasant, Racine, Somers, Union Grove, and the surrounding areas.